In yoga the opposites meet to create balance. Our existence is an embodied existence. Our body represents existence in its most basic form. It is through our body that we exist and through our body that we sense ourselves and the world around us. Our body is our primary connection to what it means to be alive. Through our body we experience what expansion and growth are and through this same body, we experience decay and finiteness. It is through our lived body and our emotions that we experience what is important to us. We experience connection with other people primarily through our body. When we overestimate ourselves and don’t recognize our limits, our body will let us know. Even when we don’t find a purpose in life, our body will react or give up. It is through our body that we notice if a situation makes sense to us or not. Through our body, we can sense that we are alive.In yoga we put the embodied ‘here and now’ experience at the heart of the practice. Focusing on the living moment in yoga provides a direct pathway to the core of our existence. Existence is not to be found in the past, nor in the future, nor in our life story. Life is here and now. One of the great paradoxes of life is that when we listen to our body in the ‘here and now we might transcend our individuality, feel connected to something universal and tap into the Un-Known. "Your physically-felt body is, in fact, part of a gigantic system of here and other places, now and other times, you and other people, in fact the whole universe. This sense of being bodily alive in a vast system is the body as it is felt from inside"
There are many possible ways of understanding the meaning of yoga. Although Yoga has its roots in Indian thought, its content is universal. Where we begin depends on where we are at the time of our lives. We can begin practicing yoga from any starting point and gradually integrate all aspects of ourselves including our relationships with others, our behaviour, our health, our breathing and our meditation path. Yoga is a Sanskrit word coming from the root "yuj", which means to "unite" or "join" the aspects of ourselves which were never really divided in the first place. It also means to "yoke" or to engage ourselves in a self-training program, systematic process, in which we work with the grosser, or more external aspects of our being, and then move inward, into more subtle practices, which gently brings us to meditation. The postures, relaxation methods, breathing practices and meditation vary, depending on our level of experience. Practicing yoga on a daily basis, naturally, brings us a feeling that yoga is also our direct present participation in the nurturing force that is already given. We begin with grounding and by sensing the state of our body, breath and mind. gently acknowledging where and how we are attention ...without trying to change it, simply acknowledging it. We let our attention wander through the senses, body sensations, breath and thoughts that are present. Just to realign ourself with the present moment and consider what would bring balance in your practice today. 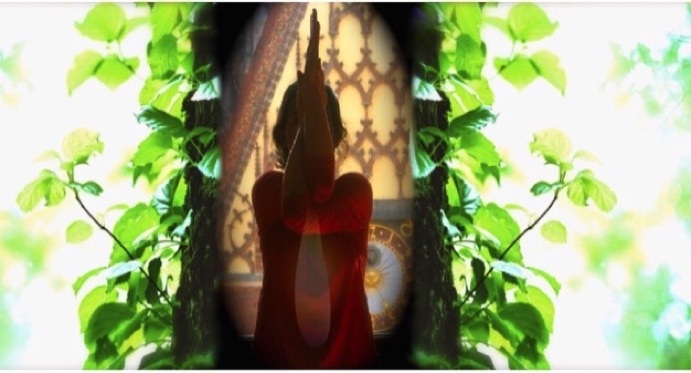 Acknowledge your deep intention for today's practice..
Asana: May your head, neck and trunk be aligned.... Listen to your body..
During the session we go through variety of standing and sitting positions, forward and backward bends, twists and inversions. Each of which has not only a strong physical effect on the body, bringing flexibility, alignment and releasing the unnecessary tensions but also psychological effects. Each movement unfolds some aspects of our consciousness and deepens our inner awareness. This for many of us is a beautiful and one of the most direct ways of meeting ourself. In each movement, each position we are experiencing our boundaries. We meet the limits of our bodies or the resistance of our minds. This point, this “edge”, is a highly important place; it is a creative teacher from who we can learn about ourself. If we approach this resistance gently, sensitivity and consciously our body responds by opening, allowing us a greater range of motion and freedom. If we shy away from approaching our limits, we may miss our occasion to learn and in time our own dogma/tightness will contract upon itself and we may grow even tighter. If we try to push ourselves past where we are honestly able to go, we only impress ourselves with a temporary surge of ambition and this feeling could contract upon itself with subsequent tightening leading us to potentially dangerous misunderstandings. Perfection is not a goal. The goal of the asana is to live in your body and learn to perceive clearly through it. There comes a time when we move our attention towards the breath itself. Mindfully observing the way our body is breathing itself, observing how the breath affects our body and mind and how the body and mind affect the breathing. When the mind is busy, the body is tense and the breath normally becomes short, irregular and shallow. When the mind is quiet, the body is relaxed, the breath becomes easier, rhythmic and naturally deepens. 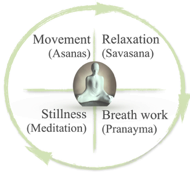 According Hatha Yoga Pradipika, observing rhythm of the breath, brings a restless mind to stillness. Breathing practice is smoothing to the nervous system and helpful for focusing attention. Much like Asanas, breathing practice helps free up tensions that are stored in the body, especially around the area of the pelvis, abdomen and diaphragm. As we reconnect with the breath through effortless observation and increased awareness, a door to the unexpected is opened. There are infinite discoveries and benefits to be experienced: a feeling of lightness, renewal of energy, a grater calmness and clarity of the mind. We realise that not only are we breathing this life, it is also breathing us. As you settle deeper into your observing nature you are invited to explore and deepen your breath through pranayamas (breathing inquiries). Practitiones of Yoga have different inclinations towards the practice stages of preparation, stretches, relaxation, breathing, and meditation. Some may like to spend a long time with the body, while others prefer breathing exercises, and still others seek the stillness of meditation. Each of these stages work together, one leading into the next. There is no perfect, one-size-fits-all formula in Yoga. It is best to spend the amount of time with each stage that is just right for you. Emphasizes movement, alignment, rhythm, flow and requires appropriate effort. We begin by loosening, waking up, then flow into core practice enjoying the fullness of our expansion, before calming down, undoing the unnecessary tension and letting go. A balanced array of hatha yoga postures will consist of standing and seated poses, as well as postures focusing on balance, forward bends, backward bends, inversions and twists. The full sequence is completed with relaxation or meditation.